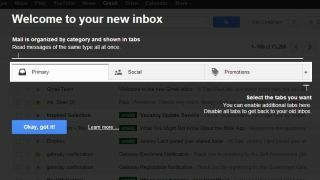 Gmail's 'Promotions' tab an excuse for spam? Google is spamming Gmail users with 'ads that look like like real emails,' Microsoft has pointed out in a new attack on its rival web giant. In the latest barb aimed in Google's direction on the Scroogled.com website, Microsoft accused Google of using a crafty Gmail redesign, which touted a reduction in inbox clutter, to spam users. Microsoft says Google has gone beyond reading emails to target users with ads and is now using the information to send ads directly to their accounts, marked as unread emails. The post explains how the spam from third-party advertisers appears in the Promotions tab within the Gmail web client and are addressed from the 'no-reply@google.com' email account. "Google violates your privacy by reading every single word of every single email sent to and from Gmail accounts so they can better target you with ads," the post read. "Now, they're going one step further over the line by using that same personal information to spam your inbox with ads that look like real emails. "Your email provider should protect you from spam, but Google is doing just the opposite; they're reading your private email conversations and using what they find to push junk mail directly to your Gmail inbox." The ads are only lightly identifiable by a small icon and a slightly different colour shade. As with real emails, these ads can be stared and added to the Primary inbox, Microsoft explains. "They watch everything you do any use it to make a profit off of you," an accompanying video clip claimed. The point to all this, of course, is to point how how different Microsoft's own Outlook.com service is. The company is attempting to win over Gmail users by pledging never to scan the content of inboxes for the purposes of targeting users with ads. If you'd rather not take Microsoft's word for it, here are 10 ways we think Outlook.com beats Gmail.